in order to show to the commoners that they, too, suffer in the area served by TEPCO, speculates a journalist following Japan's imperial families. The Crown Prince and Princess are taking their small daughter to the imperial retreat in Nasu in Tochigi Prefecture. Radioactive rice hay containing 106,000 becquerels/kg of cesium was found in nearby Nasu Shiobara. In Professor Hayakawa's map, you can see why. The area's radiation contour is at least above 0.5 microsievert/hour. 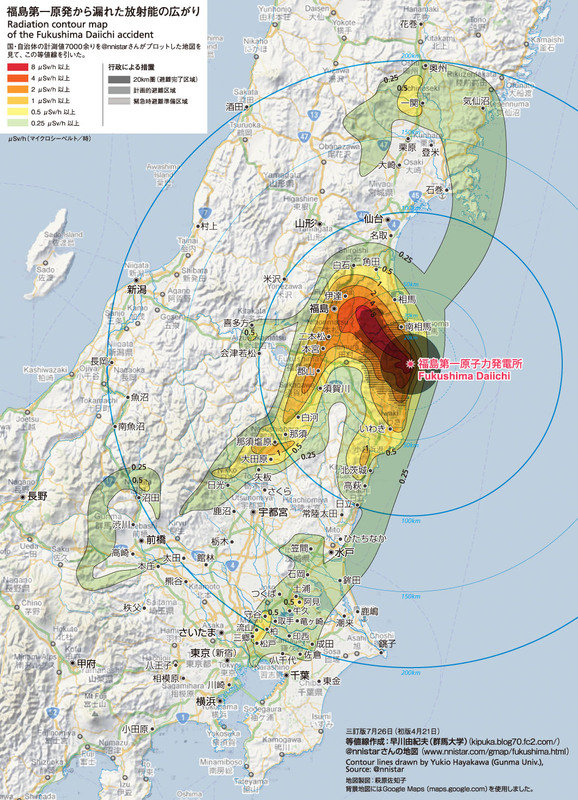 (Look for the area just outside 100 kilometer radius, southwest from Fukushima I Nuke Plant.) You can view one of his photographs and see why (picture taken on July 12 at the rice field in Nasu Shiobara, air radiation level of 1.358 microsievert/hour). Now it's a summer vacation season, and Japan's imperial families will spend the summer in imperial retreats. After the nuclear plant accident, some people have been wondering where they choose to go. According to one journalist who follows the Japanese imperial families, "The Emperor and Empress go to the retreat in Suzaki [in Shizuoka Prefecture] and Karuizawa [in Nagano Prefecture], and the Crown Prince's family goes to the retreat in Suzaki and Nasu, in Tochigi Prefecture. It has been like that for several years now. But this year, a very high level of radiation has been detected in Nasu. So we've been wondering if they go to Nasu this year. The Crown Princess particularly likes the Nasu retreat, and the family usually spends more than 10 days there. But there are some who voiced concern over staying in the high-radiation Nasu for an extended time, considering their daughter, Princess Aiko is only 9 years old." The radiation level in Karuizawa is lower compared to Nasu. There were those in the Imperial Household Agency who recommended the Crown Prince's family to go to Karuizawa for the summer, but it was decided that the family would go to Nasu, just like last year. "Officials at the Imperial Household Agency were saying, "The summer retreat will be the same as last year. It cannot be outside the area served by TEPCO." Karuizawa is the area served by Chubu Electric. When the Japanese citizens are suffering the heat of the summer in order to "conserve electricity", they may not look kindly at the Crown Prince family escaping the TEPCO area. The imperial retreat in Nasu let the earthquake/tsunami evacuees use the bath for the employees and it was very popular with the evacuees", added the same journalist. There's no way that the Crown Prince and Princess are not worried about the effect of radiation, but they [or the Imperial Household Agency] decided to portray themselves as one with the citizens of Japan. At least some citizens of Japan would understand if they escape TEPCO, and rather have them take their young daughter to a lower radiation location and state the reason clearly - to avoid radiation. It's not that the imperial families have much say in the matter. After all, the Kan administration sent the Emperor and Empress to Fukushima, had them eat Fukushima food and bring some as souvenirs. A little vacation is not the same as living there. I hate people. By the way, the fact they are using their daughter is sad. I wonder where Akishinono-Miya and his family are going for the summer. His little son will be Emperor in the future. It's really sad and almost disgusting. I hate to see the government using these people for foolish propaganda. It's likely that the government wants to send a message through the imperial family that even the areas receiving heavy doses of radioactive caesium are safe. This is an unconscionable use of a child but all the children of Fukushima and other areas that took the brunt of the radiation are now hostages to TEPCO and the bureaucracy. 2° Wiki or Google it. This is just an obvious PR stunt like Matt said visiting is one thing living there is a totally different animal. Is the princess going to kick up radioactive dust playing baseball or clean out radioactive pools? I doubt she will even be subjected to contaminated food beyond a few photo-ops. If the royal family wants make a real statement they should permanently move to the affected region to suffer along with their subjects. That goes for all the nuclear boosters in Japan they should be moving into the effected region so they can quell all the "baseless rumors". The power companies should get together and start a fund to move the "whiners and crybabies" out of the region so they can stack it with nuclear boosters like a public meeting then everybody could be happy. radiation is dangerous in long term, not in short term. It is sad to see that the emperor is cautioning the government attitude. Suffering with the people and share their burden ... two weeks is not helping them. They just want to keep their face but they are not helping. By going there they are almost saying that the contamination is not an issue.. But the professor in your last post really is telling differently. In the central Tokyo where they live, the air radiation level is much higher than the official Tokyo number in Shinjuku since the accident. They live in a park-like setting with tons of trees, dirt, grass (i.e. even higher radiation).